We're car (and bike) guys—pure and simple. Performance Rentals was created to serve the kind of customer who knows what makes for a truly rewarding driving experience. Legendary marques and nameplates, a well-refined suspension, a professionally tuned engine and powertrain, audiophile-quality custom sound systems, a proper manual gearbox—and above all, a standard of service exemplified by a straightforward, secure, no-hassle online booking system to help get you on your way in the car you want. We saw that this kind of rental experience was simply not being provided by the existing exotic "rent-a-car" market, often dominated by anonymous, confusing rental company websites that show no special appreciation for the cars they offer. Cars to us are not a commodity; they're a passion. We couldn't find a rental company that understood this the way we do... so we decided to do it ourselves. That's why the kind of cars we offer simply can't be found anywhere else, at any other company, for any price. You'll be sure that the car you drive from our lot has been fine-tuned and strengthened with stability and safety enhancements to ensure it'll stand up to the needs of a demanding driver. You'll be sure that all of our vehicles are prepared and serviced in-house by professional mechanics with years of racing, engineering, and fabrication experience. And you'll be sure that the cars we offer have been specially chosen not for a stellar (and misleading) MSRP, but for their performance characteristics and engineering heritage that will give the discerning enthusiast a unique and unforgettable time behind the wheel. You won't find paddle shifters and stick-on GPS units at Performance Rentals. Instead you'll find vehicles with performance alignments that ensure they handle and turn-in with the confidence you would expect from an exotic. You'll find manual transmissions on virtually every car we have, as we understand the frustration of shelling out your hard-earned dollars to challenge your driving skills in a high-end sports car, only to grimace in disappointment as a computer does the "shifting" for you. You'll find professionally designed and installed satellite navigation and iPod-integrated audio systems in all of our cars, which allow you to enjoy more than just road noise and static on your journey—assuming you want to listen to anything other than the music our cars' engines make. So, while you might save a few bucks on a Hertz GT-H, with a boring automatic transmission and permanently-enabled traction control, at Performance Rentals you'll get a one-of-a-kind, track-tuned Roush Mustang monster making over 550 horsepower through a short-throw manual gearbox. "Cars without Compromise" is our motto; it means we wouldn't settle for any of the mediocre offerings from mainstream or specialty rental firms, and wouldn't expect you to do so either. That's why we rent flat-out street-legal race cars—some of the most pleasing and iconic drivers' cars ever made. We are located in Rockland County, New York, about 20 minutes north of metro Manhattan. 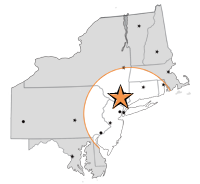 Our service territory includes the general tri-state (NJ/NY/CT) region, extending northeast to Rhode Island and southwest to Philadelphia. We can also arrange service to areas such as Boston and Washington, D.C. Please see our Policies page for delivery rates to your area, and contact us if you have any questions.